Found objects derive their identity as art from the designation placed upon them by the artist and from the social history that comes with the object. This may be indicated by either its anonymous wear and tear as in collages of Kurt Schwitters or by it recognizability as a consumer icon as in the sculptures of Haim Steinbach. The context into which it is placed is also a highly relevant factor. Kurt Schwitters, 1944. Red Wire Sculpture [painted metal, stone and mixed media] Tate Modern. I am interested in several aspects of Steinbach’s work. His interest in everyday objects, and how when juxtaposed with other objects, materials and surfaces, new relationships come into play. In the essay Once again the world is flat accompanying his recent retrospective at Hessel Museum of Art, Tom Eccles and Johanna Burton, exhibitions curators, write “Steinbach priviledges the mechanisms of display, a concept he has employed since the late 1970’s, highlighting the selection and arrangement of objects, providing new and unexpected psychological aesthetic, cultural, and ritualistic aspects of the displayed works as well as the context in which they are presented” (p.41). Haim Steinbach, 1985. 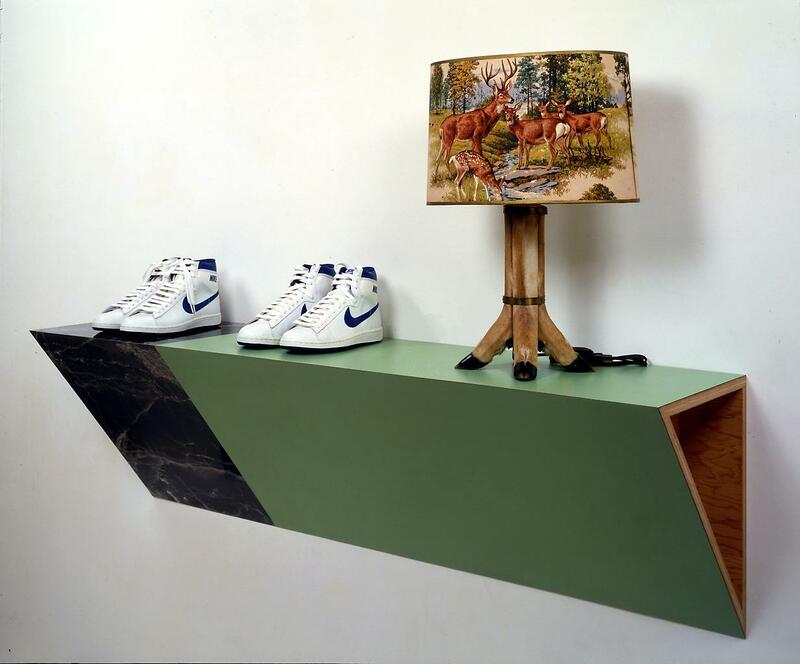 Charm of tradition [plastic laminated wood shelf, cotton, rubber, nylon, and leather athletic shoes, polyester, plastic, metal and deer hooves lamp 96.5 cm x 147.3 cm x 38 cm]. New York, NY: Tanya Bonakdar Gallery. There is a key element of what Steinbach actually does, which is to arrange groupings of things. These are not, as the artist has pointed out himself, representations of objects but rather presentations of them. Johanna Burton co-curator of his recent retrospective at the Hessel Museum of Art states “His presentation of found, bought or gifted objects alters the lens of cultural histories, mapping otherwise concealed bonds of attachment and desire between object, place and viewer. The things that are interesting that happen within the works operate in the realm of metaphor and metonymy” (p.41). 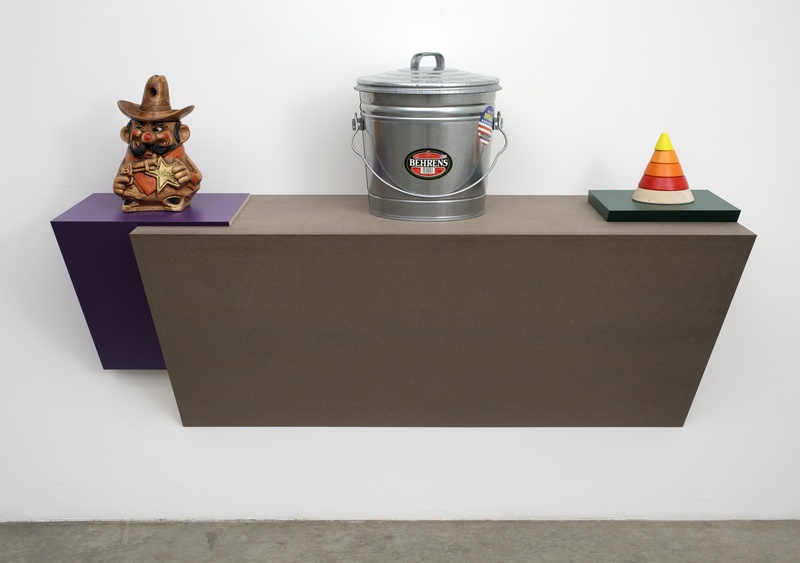 Haim Steinbach, 2011. western hills [plastic laminated wood shelf, ceramic cookie jar, aluminum garbage can, wooden stacking toy 104.2 cm × 53.4 cm x 158 cm]. New York, NY: Tanya Bonakdar Gallery. Author Giorgio Verzotti when writing on Steinbach in 2013 explains how Steinbach’s work speaks of the collectivity, the various communities that have left their mark on the symbolic objects featured in his arrangements. In some cases there are authentic communities, ethnically discrete or recognisable in other works the community may be merely imaginary, a product of mass society, shaped by the mass media as merely another of its effects, a cloned community which it is taken for granted will want whatever advertising conveys and supermarkets contain. (Object, Sign, Community. p.69). 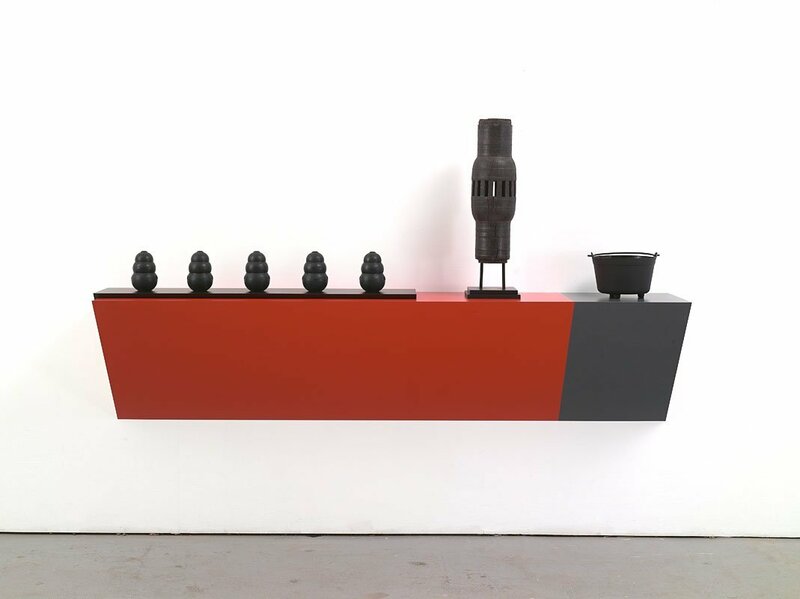 Haim Steinbach, 2008 – 12. mandarin red 2 [plastic laminated wood shelf, rubber dog chews, metal and wood cart core, plastic cauldron 117.5 cm x 219.7 cm x 43.2 cm]. New York, NY: Tanya Bonakdar Gallery. It is this latter imaginary community that I recognise as relevant to my work. 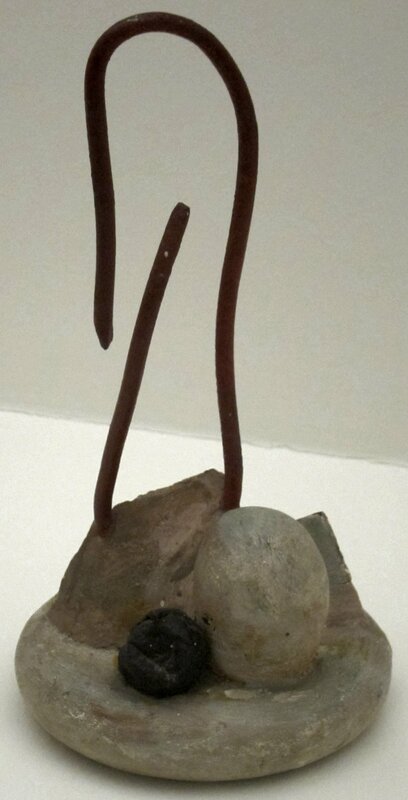 Grouping objects and materials and works in the space of display, in order to create narrative is a feature of my work. Using the device of narrative as a vehicle to allow more interesting things to happen. Roland Bathes in his 1972 critical essay on Georges Bataille’s The Story of the Eye explains that the things that happen in the realm of metaphor and metonymy, how objects become avatars as they migrate form one form to another allowing them to become both affinitive and dissimilar. This places them within a certain kind of image production of an “image system” allowing the improbable to sit alongside the common (p.239). Karen Sewell, 2015. 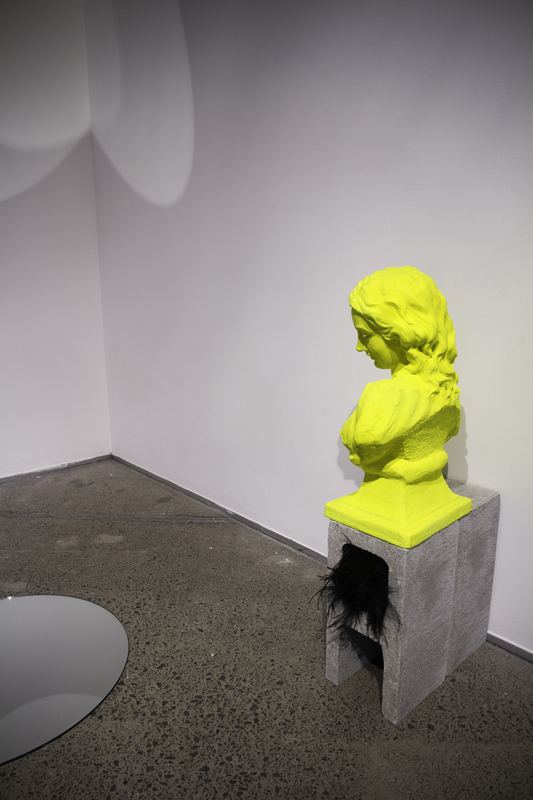 (The Reign of Narcissism) Charlotte [found resin bust, paint, concrete blocks, mirror, boa feather 90 cm x 19 cm x 40 cm]. Installation view. Auckland, New Zealand: Pearce Gallery. As I have thought about my work in relationship to consumerism and capitalism I have come to realize that the significance of this through the objects I find, is, I think more about an investigation into selfhood and the object. How self is reflected, produced or “constructed” through acquisition of objects produced for consumers. Burton, J & Eccles, T. (2013). Once again the world is flat. NY, USA : Center for Curatorial Studies, Bard College. Burton, J. (2013). Haim Steinbach: Some Collectibles. NY, USA : Center for Curatorial Studies, Bard College. Roland Barthes, “The Metaphor of the Eye,” in Critical Essays (Evanston: Northwestern University Press, 1972), pp. 239-247. Georges Bataille, The Story of the Eye (San Francisco: City Lights Publishers, 2001). All quotations from Barthes are drawn from citation above. Verzotti, G. (2013). Object, Sign, Community. On the Art of Haim Steinbach. NY, USA : Center for Curatorial Studies, Bard College. Huberman, A. (2013). Not a ready-made. NY, USA : Center for Curatorial Studies, Bard College.